Celebrities treat themselves to it before hitting the red carpet. Fitness enthusiasts use it to increase the intensity of their workouts. Plastic surgeons prescribe it to reduce pain and speed up the post-surgery healing process. And the best of all, science shows it works! 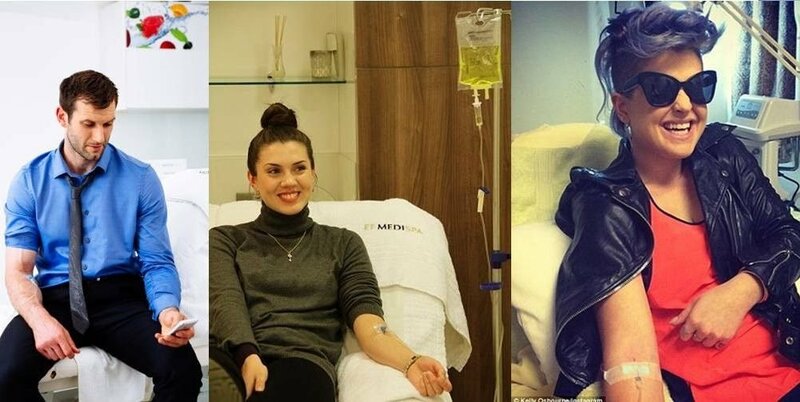 Celebrities like Khloe and Kim Kardashian, Chrissy Teigen, and Hailey Baldwin are hip to the benefits of vitamin shots and vitamin IV drips. Other big fans of Vitamin drip treatments are Rihanna, Cindy Crawford, Madonna, and Simon Cowell. So when celebrities need a quick boost of energy before a big event, expect that they’re on this. Over the years, the trend has trickled down to the rest of the population and is now gaining popularity in doctors’ offices across the U.S.
Vitamin Drips (also known as infusion treatment) is a method of feeding vitamins, minerals, and other natural substances directly into a patient’s bloodstream. This process bypasses the digestive system, which can render some substances inactive due to poor intestinal function. The IV drips help administering nutrients directly to our blood streams, providing an immediate therapeutic response by correcting deficiencies that may arise from a disease state. Vitamin Drips can be helpful in moving patients towards optimal health. Vitamin, mineral, amino acids and other natural agents are used up often because of excessive stress, illness, or nutritional deficiencies and can’t support the needs of the immune system in protecting, preventing and fighting illness. According to an article in The Daily Mail, vitamin IV treatments first became popular about five years ago when basketball players began using them as a legal way to enhance their performance. “It’s basic biochemistry; when the body has its building blocks, it works better,” Jeffrey Morrison, M.D., told The Daily Mail in an interview. Vitamin IV treatments, which are not FDA-approved as medical treatments, often include four to six weekly sessions and are made up of a cocktail of different vitamins and minerals. They can be used to treat a variety of conditions including chronic fatigue, depression, and anxiety, and can be beneficial to patients who are severely deficient in certain minerals or nutrients. Patients often report feeling much more alert, energetic and invigorated after receiving the treatment. Now, though, doctors are seeing more patients use them as a quick fix after nights of heavy drinking or partying. Peter Weiss, M.D., medical director at Earthbar, says that while vitamin drip treatments are not a substitute for a healthy lifestyle, “they can supplement what the body is missing and needs in a more efficient way,” even if you’re not an athlete. “Many of us run at a very hectic pace and can benefit from such therapies, and there are patients who suffer from chronic ailments who can benefit as well,” he adds. But not everyone in the medical community agrees. Although it’s been around since the mid-1950’s, vitamin drip therapy isn’t very well known to the general public. It’s not much of a secret to Hollywood’s top celebrities, though – Simon Cowell, Cindy Crawford, Geri Halliwell, Madonna, Rihanna, Kim Kardashian, and Kate Upton have all spoken highly of the procedure. Imagine a spa salon filled with people reclining in couches or lounge chairs. Now instead of the massage oils, foot baths, or nail dryers, you’d expect to find, imagine intravenous drips, hanging from the patrons’ arms. That’s what vitamin therapy is like.